The institution of marriage is such a great comparison to life with our Father. I think a lot of the time we miss some good points about marriage that directly relates to life with God. To many times we do not associate marriage with Kingdom meanings. Actually marriage is a shadow of spiritual things. Ephesians 5:31 and 32 state … For this reason a man shall leave his father and mother and shall be joined to his wife, and the two shall become one flesh. This mystery is great; but I am speaking with reference to Christ and the church. The church being mentioned here is not a building or an organization. The Church are the people who Jesus brings together. It is not a weekly meeting, it is a living organism made up of those of us saved by grace. One of the things I’ve been thinking about recently is how we are one with God. It’s hard to imagine that our Father lives within us. Jesus said when he left the earth, he would send us another comforter. Through his Spirit, he came to make his home within us and he is constantly with us. We always think of God sitting on a big throne, way off in heaven somewhere and that one of these days we will go and meet Him and live with Him forever. The thing is, that is not what His written word tells us. We are the temple of the Holy Spirit, God’s physical dwelling place on earth. His Spirit dwells within us and He will never leave us nor forsake us. Now it’s not saying we are God, but we are one with God. The best way I’ve found to make sense of this is to think of marriage. When two individual people fall in love, make a commitment to love each other and live together, the bible says the two shall become one. Does that mean that the spouse becomes their partner, that they somehow become the same person? No, both people remain individuals, yet they live as one. Same with us and God, we are still the person He created, yet because God loves us and we love him, he made his home within us, and His spirit lives within us. We are one with God. 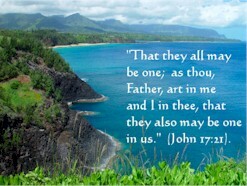 In John 17:21 Jesus is talking with the Father and asks … that they may all be one, even as You Father, are in Me and I in You, that they also may be in Us, so that the world may believe that You sent Me. Seems to me it is truly a marriage made in heaven. We do not have to wait to a future time when we live with God in some far-away place, we are living as one with Him in His Kingdom right now. We are his temple, his dwelling place, and each of us are equally important parts of his body.